Municipal vehicle hire specialist, Collett Transport Services (CTS) has invested over £2.3m in the past 12 months expanding and refreshing its fleet, with over 30 vehicles joining the fleet in the last quarter and another 13 new vehicles arriving this month. 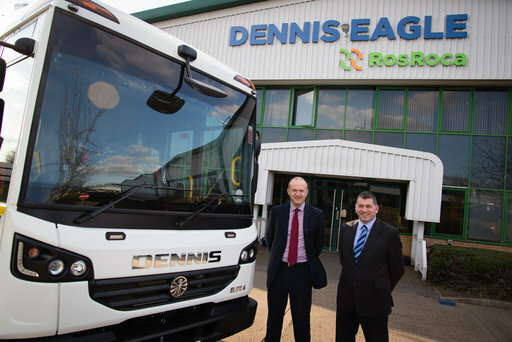 The new vehicles comprise London compliant, weighing ready Dennis Eagle Elite 6 6x2 Narrow RCV’s with Terberg OmniDEL bin lifts; NTM RCV’s fitted with a combination of bar and bin lifts; Scania 32 tonne Cab Chassis fitted wit Hyva Titan Hook Loading equipment; DAF FALF 15 tonne LHD chassis with Johnston VT651 fully built dual sweep machines upgraded for heavy duty road planing work and fitted with four-way camera systems; a Ford Transit 3.5 tonne chassis cab DRW with one-way tipping body and Meshmaster Cage kit; and Hyva 18 tonne DAF Skip Loaders. Collett Transport Services (CTS) is a dedicated provider of municipal hire and maintenance services. A member of Specialist Fleet Services Ltd (SFS), CTS benefits from being part of a well-established and financially strong company with over 20 years experience in contract hire, fleet management and workshop management.